Dr. Ehsan Ahmad completed MD Pathology from Aligarh Muslim University, Aligarh, India and European Board of Pathology. Dr. Ehsan Ahmad’s work experience spans 19 years in Saudi Arabia, Libya, Nepal, India and the UAE as a Consultant, Histopathology. 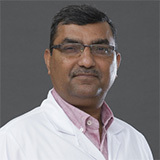 Dr. Ehsan Ahmad’s areas of expertise includes Reporting of surgical biopsies with special interest in breast pathology, gynaecological pathology and gastrointestinal pathology, Report cytology specimens both gynaecological and non gynaecological, Utilization of Immuno-histochemistry and Reporting Frozen sections, Immunofluorescence for skin and kidney biopsies. 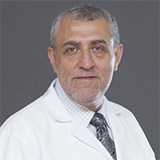 Dr. Ehsan Ahmad has attended several national and international courses including Diagnostic histopathology course at Sheffield University, Advanced Histopathology course at Princess Alexandria Hospital in UK, Gloucestershire Gastrointestinal pathology course, 7th LEEDS update on Dermato-pathology at St. James institute of Oncology at Leeds and Breast pathology course at Nottingham University. Dr. Ehsan has also attended several international conferences, the latest being European Congress of Pathology at Paris, France in June 2018. Dr. Ehsan Ahmad has several affiliations/memberships including Associate member of Royal College of Pathologists, UK; Member of European Society of Pathology and Member of Emirates Medical Association.